Twenty years ago when I went to Spain for the first time, I got to see Paco de Lucía perform at Teatro de la Maestranza during the Bienal de Sevilla. This happened after I had been living there for about six months at a time when I was just beginning to understand what flamenco was. One afternoon I got to talking to a man in a store who happened to be very into flamenco. He went to Jerez to study bulerías because, he told me, it was the cradle of flamenco. I had asked him where I could get a poster from the Bienal. He gave me some ideas but told me it was an ugly poster this year. In fact, he was very unimpressed with the line up of performers. He said they were not “flamenco” enough overall. He said they should have had many more “puro” performers. Flamenco evolves in many different ways. Some people believe certain artists’ interpretations not to be flamenco. There is room for so much in flamenco, room for a variety of tastes, room for different types of creativity and talent. I love this about it. And I love to see it all from the grandest theaters in Sevilla to the tiniest tabancos in Jerez, from the most traditional to the most modern. 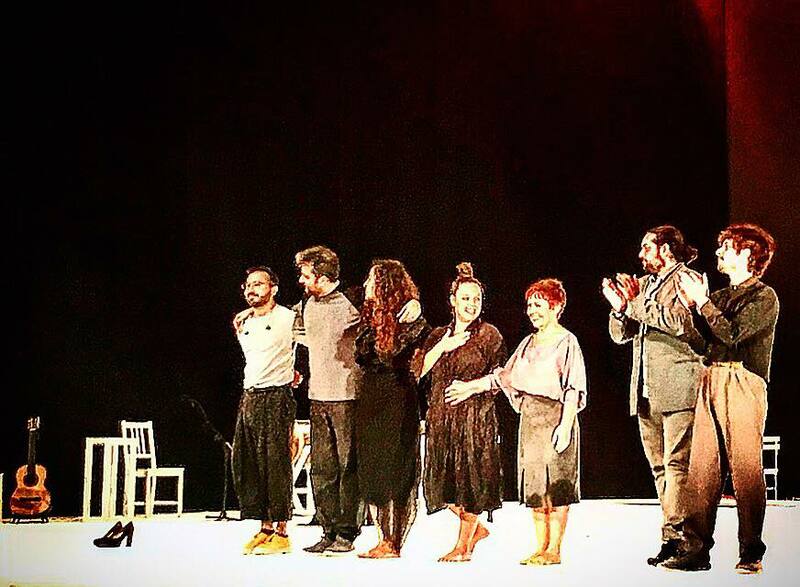 The week began with Compañía Mercedes Ruíz and their production of Tauromagia. This show is the reason I came to the bienal. I have seen Mercedes perform on her own many times in the past, and I was very excited to see what she did with her company of dancers. Especially since we got to watch the dancers rehearsing during the last Flamenco Tour to Jerez. It was beautiful on so many levels. I especially loved the interaction between the dancers and the way the pieces flowed. After the show I went backstage to say hi. I was talking to Santi and up walks Manolo Sanlúcar. I was completely starstruck and feeling too shy to ask for a picture or even to say hi! Tauromagia was the first flamenco CD I ever bought! I was flipping out after seeing Pastora Galván in Israel Galván’s La Edad de Oro with Miguel Ortega & Juan Requena at the Lope de Vega Theater. The show was AMAZING, and Pastora brought down the house! It was a work that Israel Galván created and had performed more than three hundred times over the past fifteen years with different musicians. I could watch the whole thing again right now, probably a million times. At the end Pastora sang por bulerías; it was so great. The next show I saw (from the front row again) was Andrés Peña & Pilar Ogalla’s La Tournée. More crying this time sparked by Andrés dancing his soleá. I loved this show. The artists’ chemistry was out of control. There was humor and playfulness sprinkled throughout was perfect. The singers danced (an escobilla even) and the dancers sang. (The sweetest moment was when Andrés sang for Pilar, his wife. Rafael Rodriguez’s guitar was exquisite. The final show I saw was Santiago Lara’s Una Guitarra de Dos Caras. Again I happily sat in the front row for this incredible music and to see Mercedes dance. Santi’s playing was so beautiful and to see Mercedes dancing so close. Even though I see her up close in class all of the time, this was a completely different thing. And yes, more tears were shed. Mercedes and Santi will be in P-town in May for workshops and performances.